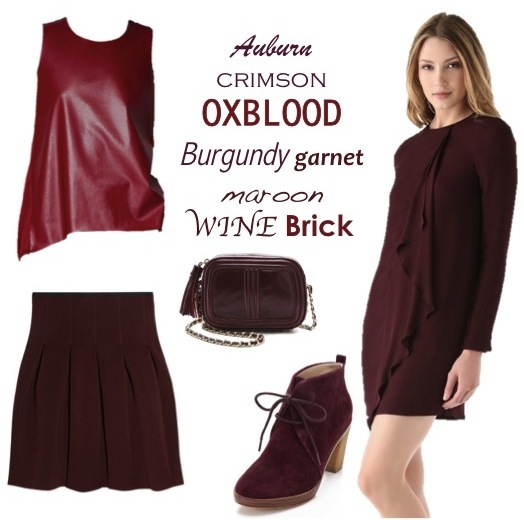 Oxblood: Auburn, Bordeaux, Burgundy, Blood Red, Brick, Crimson, Maroon, Wine, Garnet...and the list goes on...Undeniably the color of the season, oxblood clothing and accessories scream both luxury and fall. The best part is the deep red can act as a neutral and looks fabulous worn head to toe. 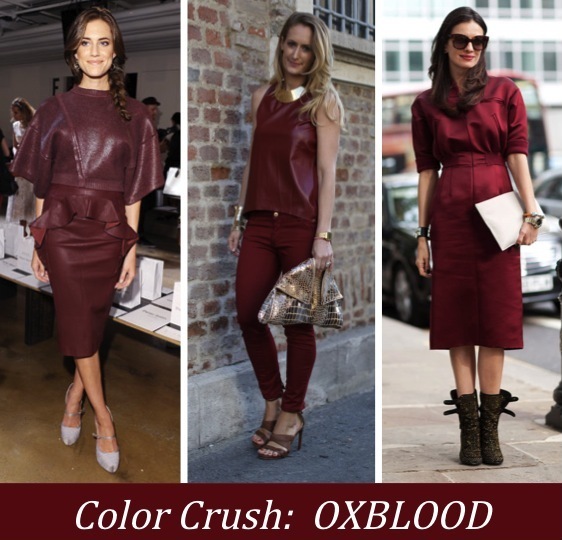 There are so many amazing oxblood hued fashions that I couldn't limit my choices to just a few, so here are some more crave worthy crimson items. Need to buy something in that color!! Love this color but am not a fan of the term 'oxblood'. ha! Love the peplum you included. i love this color so much, especially for fall. i feel like the majority of new things i've purchased recently have been some variation of oxblood. I love that skirt! I'm currently in the market for a skirt or dress in this color–but I'm also loving the leather pieces! I agree with you, the color is the best way to describe this season. Obsessed with this color! Just bought burgundy skinny jeans and now on the hunt for the perfect sleeveless leather top! I JUST went on a rant about this with my friends after buying a pair of burgundy jeans. My roommate is probably fed up with all my talk about this latest fashion trend. Oh yeah I love that colour, too! So elegant and very powerful. Even more so if it's wine red leather. Bang. LOVE! This is such an appropriate color for fall- so I absolutely can see the allure! I was not to keen on the oversize boxy trend (top left image), but it's finally starting to grow on me! I have seen this color a lot and I really want a sweater or skirt in it! So exited that fall is here. At first I wasn't that into this color – I generally shy away from reds and darker colors in general – but there's something about it that kept drawing me back. I really like the little skirt you've selected as well as that leather top – so cute! Hello, you have great blog, really lovely pictures. This post is so great, this color does scream, love those outfits, especially the first one- the leather peplum dress! This color is just as sophisticated as navy! This color looks great in so many different pieces. I love the look of leather, but I think the suede options seem perfect for fall. This colour is so lush, perfect to wear in autumn! I completely agree I love the color. Check out my blog I have it featured in my fashion post! My A/W colour!! I love the leathers.